IMAGINE this: a city fronting the watery expanse of a gulf and enjoying the hot summers and mild winters of a Mediterranean climate. In that city, not all that far from its centre on land that once housed a jam factory now long demolished, a forest garden bearing a diversity of fruit, vegetables and herbs. In one corner of this luxuriant assemblage of food and the humans who tend it is a comfortable building, well insulated against summer's dry heat, made of cement-rendered strawbales with, on its roof, the solar panels that power it and, at the back, big tanks that hold winter's rainfall for use over the parched months of summer. The new crew — John McBain, secretary (WA); Jane Mowbray, president (NSW); Sarah Ladyman, vice-president (NSW); John Brisbin, treasurer (far north QLD). It's a pleasing image you see in your mind, but you don't have to imagine it because Fern Avenue Community Garden is a reality. You find it in Fullerton on the site of the old Fullerton Fruit Factory. I think it's somehow fitting that fruit is now grown on what was once the place where it was turned into food. Figs, citrus, stone fruit, bananas all thrive here under the kind attention of the community gardeners, and all free of the fruit fly that plagues stone fruits and figs in northern latitudes. It was pleasing that the Fern Avenue community gardeners made this comfortable building available for April's national meeting of the Australian City Farms & Commuity Gardens Network. What better place to talk community gardening than a building surrounded by all this food… a diverse forest of food. 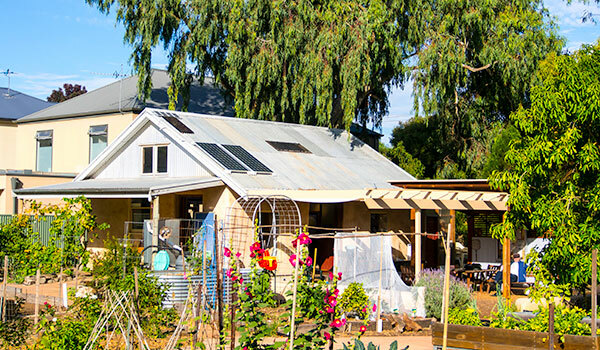 Fern Ave Community Garden — the comfortable solar powered, strawbale community building. Community gardeners are not a formal lot, however they know the value of structure and so had adopted a loose agenda of topics for the two day national meeting. the Communications Team looks after the website, social media, eNews and other communications business. But what of the future? What are the Network's aspirations? Working this out was an interesting conversation as it has to do with the capacity of the Network and the people managing it to carry them out in coordination with the national trend in the growth of community gardens and associated community food systems. We used the SOAR process in assessing the Australian City Farms & Community Gardens Network. The acronym stands for Strengths, Opportunities, Aspirations and Results and is an alternative to the SWOT process (Strengths, Weaknesses, Opportunities, Threats) that sometimes becomes bogged down in the 'weaknesses' and 'threats' components. SOAR doesn't ignore these but considers them within the context of its 'Aspirations' and 'Results' components. a demonstrated capacity for education and advocacy; this consists of an ability to act quickly when needed, to connect people and organisations and to make best use of our online resources. Opportunities — what is open to the Network's intervention and what new things could be made? to improve the resilience of our food systems by creating common space where people meet and by increasing the skills of members. Aspirations — what is it that the Australian City Farms & Commuity Gardens Network aspires to being? to assist in building optimism and resilience. Results — what can we achieve in the near future? develop a new communications plan. A meeting without food, wine and conviviality is a poor sort of meeting, so it was appropriate that the Fern Avenue gardeners organised that on one evening we ate together at Adelaide Central Market, the main source of fresh, South Australian foods in the city and a far better shopping experience than the supermarket. On the other evening the gardeners fired up their wood-burning, brick oven that stands adjacent to the community building, and made pizza. This was washed down with the smooth, home made wine of a local councillor who came around, all to the sound of a folksy-sounding band. David Pisoni was at the pizza evening. David is the local state MP, a Liberal, who has been supportive of the community garden and who spoke of how he is an advocate of South Australia's GMO moratorium. The moratorium has cross-party support in government. Steven Hoepfner and Jane Mowbray sample the produce at Walyo Yerta Community Garden, Adelaide. The notion that the Network had realised one of its goals — the recognition that community gardening and city farms are a valid urban landuse — was reiterated. The evidence for this is the growth in the number of community gardens around the country and the rate of increase over the past ten to fifteen years, as well as the increasing number of local governments adopting policy to enable community gardens and facilitating their creation. 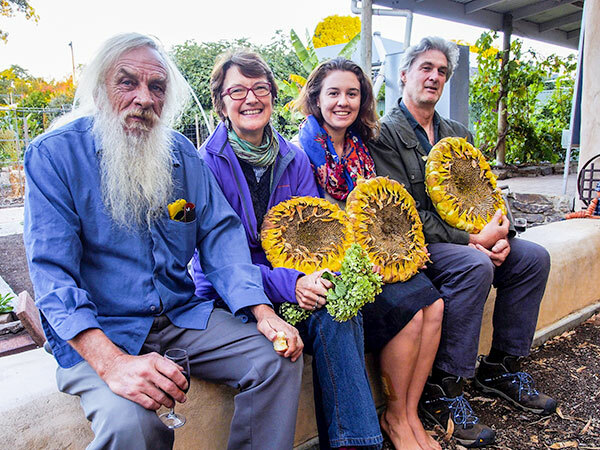 Even the NSW and Victorian state governments support community gardens on social housing estates. This was something that had been recognised before but it was now even more self-evident. Since the first community garden open at Nunawading, Melbourne, in 1977, community gardening has moved from the practice of a few urban creatives to become part of our urban culture. Now, it is something of a diverse socio-agricultural practice with culinary, social and educational benefits. 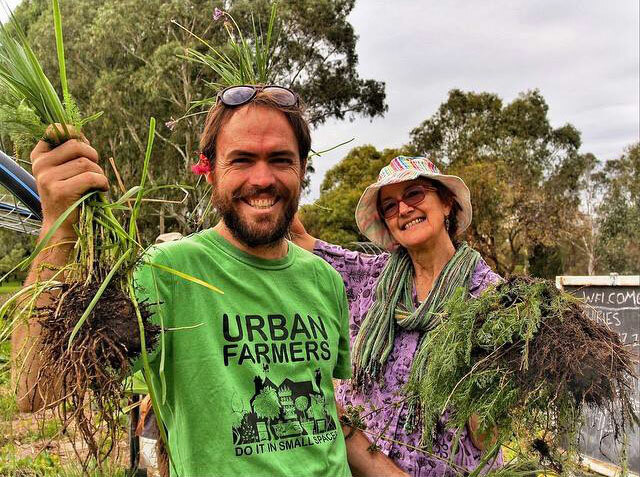 Since its beginning 20 years ago thanks to the research and foresight of Darren Phillips, the Australian City Farms & Commuity Gardens Network has played a substantial role in legitimising community gardening and related community food initiatives. Not that all involved recognise it as such, community gardening is part of a broader fair food movement that is itself quite diverse. This realisation is growing and it remains a challenge for the food sovereignty advocates in the movement to assist community gardeners make the link between their practice and the wider food sovereignty, fair food movement. 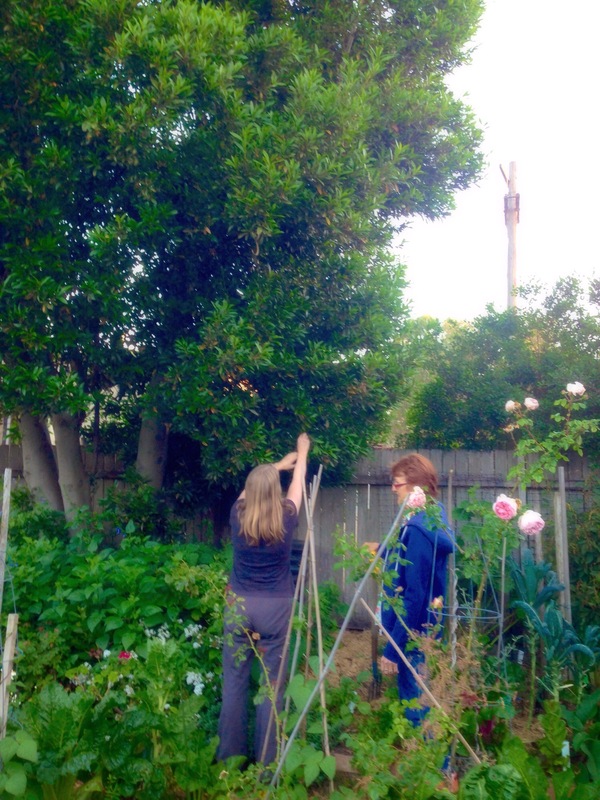 AS THE TALL EUCALYPT in Jane's garden turned to silhouette we hurried to harvest the leaves. Evening was coming. Jane took her scissors and cut large twigs of curry tree foliage. Others moved among the budding fruit of globe artichoke to pluck individual leaves from the lemon myrtle and bay trees. The garden was a fine place to start a meeting and it was where we always started it. As Stephen Covey said in his widely-read book on managing time, you put first things first, and first thing at these meetings was checking out Jane's small but prolific and botanically diverse Inner West home garden. Some months ago, the Sydney team of the Australian City Farms & Community Gardens Network decided that Jane Mowbray’s house in Sydney's Inner West was more or less the midpoint when it came to getting together for our meetings, so it is there that we converged from locations east, west and close by. Part of the reason, I now know, was so people could pillage cuttings, leaves and assorted edibles Jane's garden. We long ago threw out conventional meeting structures to avoid the mental statis that formal process brings and to avoid the boredom that can accompany meetings. We chose conviviality and food as our meeting structure instead, and it's around these that the business of the meeting happens. Meetings become social events. 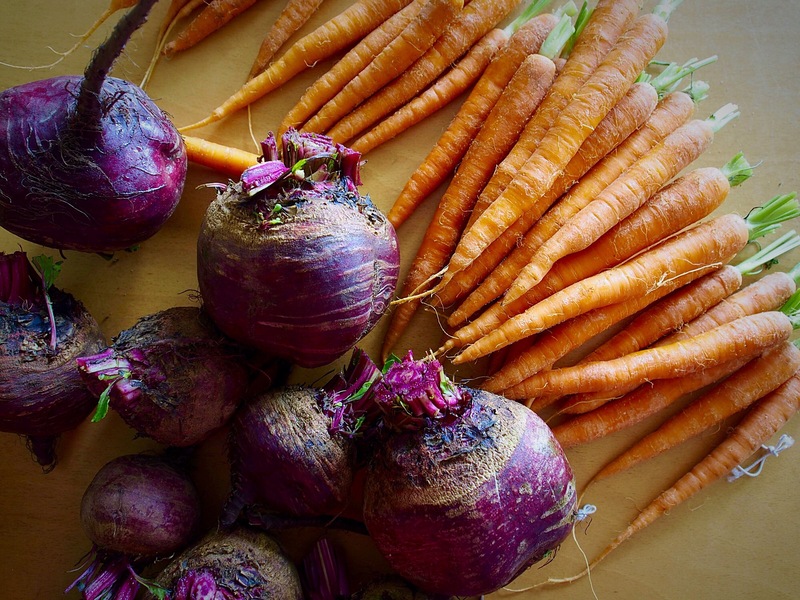 Founded back in 1995, the Australian City Farms & Community Gardens Network is a loose, national entity advocating and educating around the practice of community gardening and its role in community development and urban agriculture. The Network offers a range of educational, instructional and advocacy material through its website. People have downloaded and used this and have told the Network crew how useful it is. We distribute it all through a Creative Commons licence. Our structure is that of a distributed network. Were you to map our network you would find that it fits well the classical network theory model of connections between a number of larger hubs, each interconnected into their own network made up of various nodes, and a larger number of smaller hubs with fewer connections, and even a few unconnected nodes as well. As many of these are what's known as 'small world networks' with strong internal and localised links, the community gardens network fills that necessary role of the 'weak link' that connects these small world networks into the larger distributed network structure. This makes possible the flow of information, ideas and inspiration between them so that more people and organisations can benefit from the experience of the few — think of it as infrastructure for scaling-up. Our website is a repository for long-life material while most discussion is on our social media where we have a Facebook Page for posting information from the Network and a Facebook Group where anyone can post relevant material. We've a national coordinating team that meets on the internet or via teleconference. 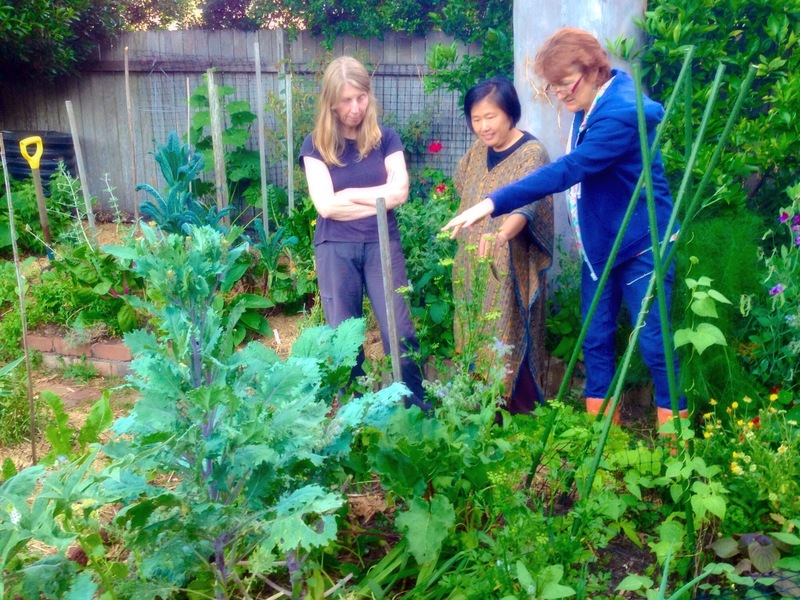 The team reflects the decentralised nature of community gardening and city farming in Australia in its federal structure. Within the limitations of being a voluntary entity, the Network is interested in expanding its role. A start has been the recent distribution of letters to local government to encourage their placing the community gardens they support onto the Network's online map. In different places, Network members have established a relationship with local government as this is the level of government that is often responsible for land access for urban agriculture and for policy that affects it. Local is the level of government that most directly affects people. On our organising teams we include people with skills and experience in education, local government, horticulture, international development around food, work with remote and indigenous communities, programming and coding, online systems design and management, communications and community organising, among others. We're more a doing organisation than academic and we seek to use practical projects to make our cities and communities more resilient. People, we find, are attracted to actually making things. The Australian City Farms & Community Gardens Network represents a national community of practice within the emerging fair food movement. Research I carried out on a consultancy to develop policy directions for a proposed local government policy to enable community gardening disclosed that access to fresh food, bringing people together in social groups and learning were the three main reasons people became community gardeners or city farmers. Food, a sense of community and social learning — for the Network, those three things are necessary components of resilient and convivial cities… cities that further the long-established role of urban centres as places of opportunity. The last of day's fading light was giving way to the soft darkness of evening, so we retreated inside, into Jane’s small but homely kitchen. There, gathered around plates of lentils with kale and spinach combined with curry leaf and garlic, Ling’s sliced raw green mango, crusts and dips, some small sweet things salvaged uneaten from a council meeting and a bottle of pleasant Australian organic white, we engaged in the official business of this, our most recent meeting. Among other things, we learned how to write website material and post it onto the Network's blog. Food, friends, talk and taking cuttings from the garden - if only all meetings could be like this.